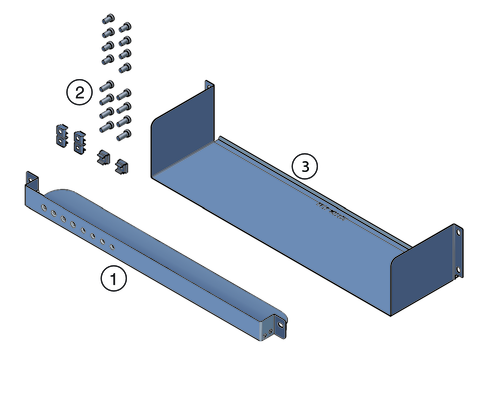 This procedure describes how to install brackets into a system equipped with the universal rack mounting kit. The following picture shows the shipping bracket kit. Screws and cage nuts. The kit contains two sets of screws (M6 and 10-32), plus cage nuts. 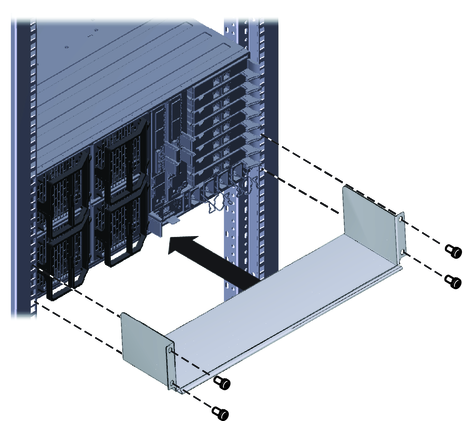 The cage nuts are not used for the Sun Server X2-8. Remove the two (short) screws that fasten the bottom of the bezel to the rack. Insert the front bracket (2) into the front of the server with the supporting flange underneath the server. 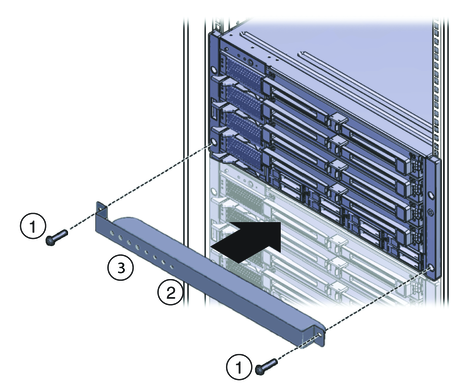 Use the two long screws (M6 x 25 or 10-32 x 1) (1) to fasten the shipping bracket (2) to the front of the server. Note - The front shipping bracket includes eight threaded holes (3) used for storing unused screws. When the shipping brackets are not installed, the bracket holds the long screws used to install them. When the shipping brackets are installed, it stores the short screws that were used before the shipping brackets were installed. Insert the short screws into the empty storage holes on the shipping bracket. They will be stored there to be used when you remove the shipping bracket. For square-hole racks, remove the bottom screws (1) that hold the rear adapter brackets (2) in place. See the following figure. Caution - Do not remove the bottom screws unless you are certain that the upper screw (3) is in place. Otherwise, the server could fall. Insert the rear bottom bracket (1) under the back of the server with the side panels facing up, as shown in the following figure. Use four screws (2) to fasten it to the rack. Do not finish tightening these screws. They should be tight enough to hold the bracket in place, but you should still be able to move the bracket slightly. 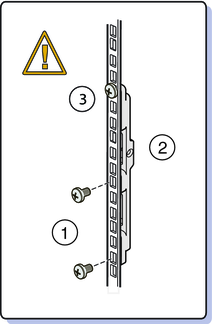 For square-hole racks, use the two screws that you removed in Step 5. For round-hole racks, use either 10-32 x 10 or M6 x 12. The bracket should be fastened to the posts, but loose enough to move slightly. Push the bracket up so that it rests firmly against the bottom of the server, and then finish tightening the screws that hold the bracket in place. If necessary, loosen the screws enough so that you can move the bracket, and then tighten them after pushing it against the bottom of the server. Caution - To prevent damage to the server during shipping, the bottom shipping bracket must rest firmly against the bottom of the server.